Roughly half of Millionaires (48 percent) are retired, according to our new wealth segment research of households with a net worth between $1 million and $5 million (not including primary residence). Nearly three-fourths identify their risk tolerance as moderate (59 percent) or conservative (15 percent). What is the distribution of their total assets? Millionaire retirees, or those who are semi-retired, have the majority (60 percent) of their total assets in investable assets. Sixteen percent of their total assets are earmarked toward their principal residence, with 7 percent comprised of their total real estate investment and insurance and annuities, respectively. Retired or semi-retired Millionaires have 8 percent of their total assets in their defined contribution retirement plan, and only 2 percent in a privately held business. In comparison, Millionaires who are not retired have less than half (46 percent) of their total assets in total investible assets and 16 percent in their defined contribution retirement plan. 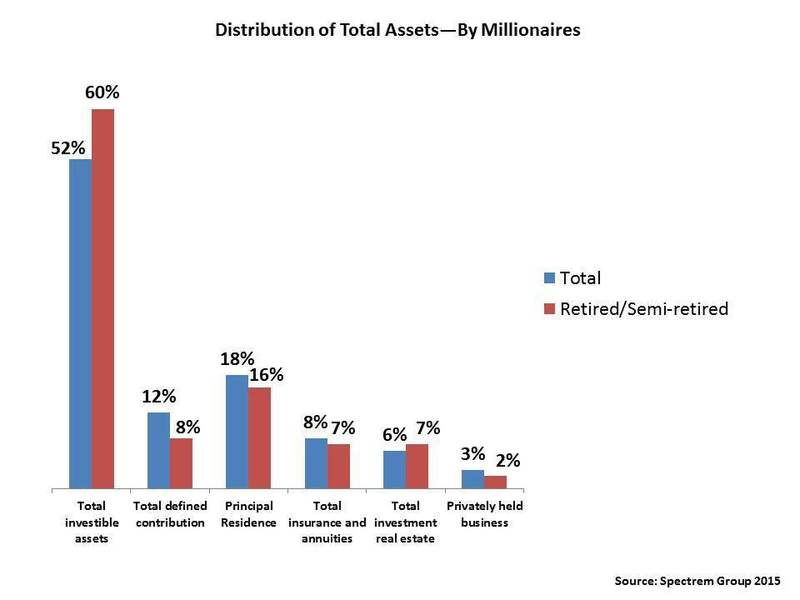 As to the distribution of their investible assets, retired or semi-retired Millionaires have half in equities, which is on par with their cohorts who are still working (47 percent). They have slightly more invested in fixed income (17 percent vs. 14 percent), but less in cash and liquid investments (15 percent vs. 22 percent). Millionaires, both working and retired, are equally invested in alternative investments (just 3 percent).